Diane's experience at the Mulholland Drive party (specifically, her state of melancholia), represents her alchemical nigredo stage. is represented in Diane's dream by the chaotic accident on Mulholland. In other words, the accident is the dream-representation of Diane's nigredo. Lately we have been discussing Diane's process of individuation. Swiss psychologist and psychiatrist Carl Jung associated the stages of individuation with the processes of alchemy. In the below, we'll go over the basics of alchemy, and we'll begin to look at Diane's dream-representations of alchemical stages. In the framework of psychological development (especially for followers of Jungian psychology) these four alchemical steps are to be taken as analogous to the process of attaining individuation. [c] Let us examine the four steps in greater detail. There are at least two depictions of putrefaction and decomposition in the movie: The partially decomposed body of the woman that Betty and Rita, and in another scene the Cowboy, see lying in bed, above left; and the person behind Winkie's (whom as we've said, represents Diane's shadow), above right. The accident on Mulholland is obviously a chaotic event. After Rita experiences the chaos of the accident, she is found in the shower at Betty's Havenhurst apartment (as shown at left). The shower represents her albedo/ablutio, i.e., the (attempted) washing away of impurities. As we've seen, Louise Bonner represents the Wise Old Woman archetype in Diane's dream. Later in the analysis, we'll look at what yellow/yellowing has to do with Diane's citrinitas. Louise Bonner represents Diane's Wise Old Woman archetype. 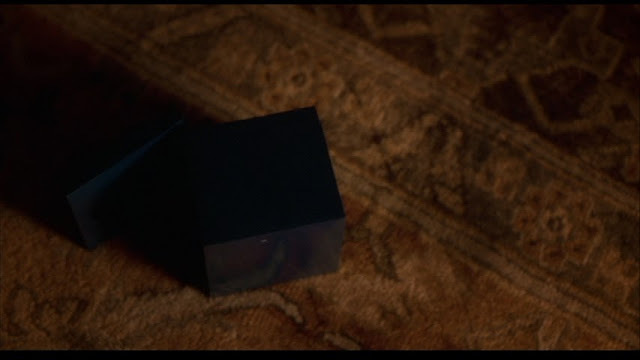 Diane's dream-rubedo occurs at the moment that Rita is 'sucked into' the blue box (which then falls on the floor - see screencap at left), i.e., it takes place just before Diane awakens. Later on we'll look at Diane's rubedo in more detail, including what redness has to do with it. We should observe here, however, that the reason the movie seems like a Möbius strip to many viewers, is because a nigredo is presented to us as taking place both at the beginning of the movie, during the chaotic accident, and near the end of the film, during the chaos in Diane's apartment when she 'sees' the couple who raised her haranguing her, and then shoots herself. It's as if Diane's alchemical process 're-begins' at the end of the movie (by virtue of the fact that the ending represents a nigredo). Within this context, the film acts on each viewer's subconscious (i.e., unconscious) mind. a. Wikipedia, 'Philosopher's stone'. Web, n.d. URL = https://en.wikipedia.org/wiki/Philosopher%27s_stone. b. Wikipedia, 'Magnum opus (alchemy)'. Web, n.d. URL = https://en.wikipedia.org/wiki/Magnum_opus_(alchemy). d. Wikipedia, 'Nigredo'. Web, n.d. URL = https://en.wikipedia.org/wiki/Nigredo. e. Wikipedia, 'Albedo (alchemy)'. Web, n.d. URL = https://en.wikipedia.org/wiki/Albedo_(alchemy). f. Wikipedia, 'Citrinitas'. Web, n.d. URL = https://en.wikipedia.org/wiki/Citrinitas. g. Wikipedia, 'Rubedo'. Web, n.d. URL = https://en.wikipedia.org/wiki/Rubedo.